City of Washington Parks and Rec Dept. Food by these great local vendors! Washington is one of the most river-centric towns on the Lower Missouri River. The beautiful park overlooking the river was the ideal place to hold, not just a huge river clean-up, but also a local river festival highlighting the town's connection to the river. 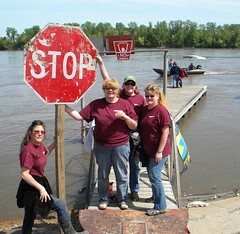 218 volunteers gathered together to clean-up 15 miles of the Missouri River. With the help of Missouri Department of Conservation and Washington Boat Club, volunteers were shuttled to locations along the river to gather trash and bring it to shore. From hazardous waste to appliances, plastic bottles to tires, 8.42 tons of trash was removed from the banks of Big Muddy! Washington Parks & Rec. Dept. supplied the landfill dumpster and skid steer for moving trash. The Wyman Center brought 8 canoes and a bunch of volunteers. Big Muddy Adventures brought the massive Clipper Canoe. Several local paddlers rounded out the bunch and cleaned up the stretch of river from Colter's Landing to Washington. Gloria Attoun once again brought together a host of local and regional organizations together at the Rennick pavilion overlooking the river for a day of education, art, music, good food and celebration of the river. See the impressive list on the right for participating organizations, artists, experts and awesome bands! It was all capped off with an old-time dance jam. 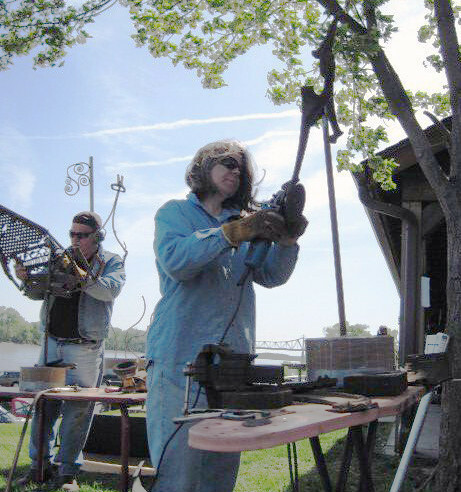 "Trash is a failure of the imagination", and four area metal sculptors proved it at the Festival. Joey Los, Larry Pogue, Patrick McCarty and Greenway Network teamed up with Cee-Kay Welding to turn trash into treasure. The works of art they created were auctioned off by KDHX radio's Jean Ponzi to raise over $1,200 to support Missouri River Relief. Thanks to everyone that created art and bid on it! Most of the trash came from our March 6 Mari-Osa Dump Clean-up, along with items found at the Washington Clean-up. A partial list of items recovered from the Missouri River by volunteers. Our most common items are plastic bottles and bits of styrofoam.